A few years back, I was the chef at an establishment where half of my customers would be on Weight Watchers about this time of the year, so I would offer a low-fat, healthy lunch option daily in the cafe. I created this recipe and it has been one of my “most requested” by customers at every place I’ve worked. In fact, most are surprised to learn this is actually a healthy, low fat recipe! When you first read the ingredients, you may question this one, but everyone does. Once they try it, they are hooked. I made it this past week at work (first time at newest cafe) and everyone has been asking for the recipe. As you read the recipe, several things are “optional” ingredients. They add to the dish, but they are not required, as I’ve made the recipe with those items and without, depending on what I’ve got in my pantry. Give this one a try and you’ll agree it’s really quite tasty, and for those of you “counting points”, this one is 7 points! Preheat oven to 350F. Grease the bottom of a glass casserole dish with olive oil and arrange chicken in one layer in the dish. Size of the dish depends on size of your chicken. A 9×9 will normally hold 4 breasts, a 13×9 might be needed if you use boneless tenders. Top the chicken with the minced garlic. In a small bowl, combine the curry powder, cinnamon and salt, then sprinkle mixture on top of chicken. 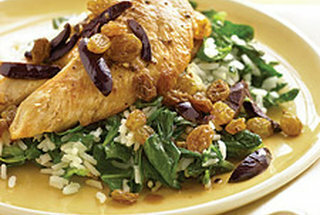 Top chicken with the raisins and olives and pour the wine over the top. If using the artichoke hearts and Feta, add it last in that order. Bake for 20-25 minutes or until chicken reaches an internal temperature of 165F. Serve with rice, couscous, fresh spinach, sauteed broccoli, etc for a light complimentary dinner.